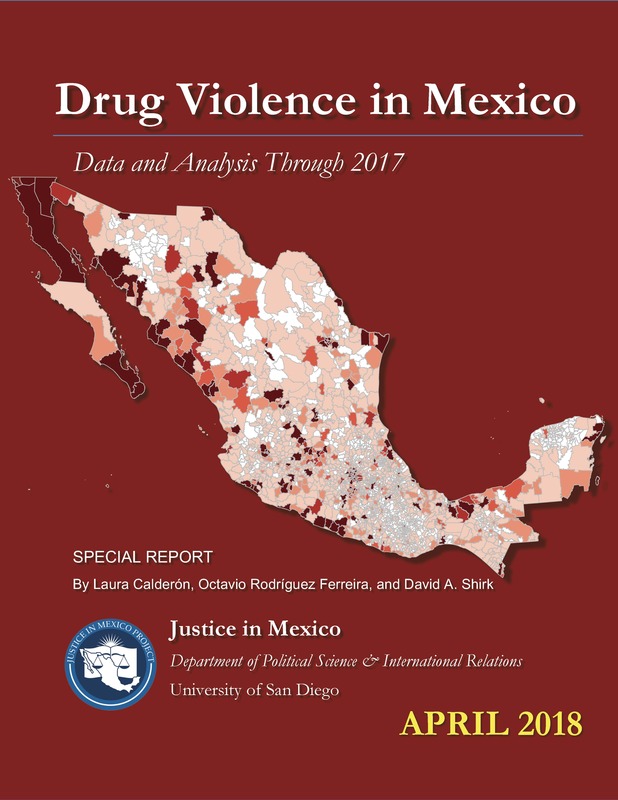 04/11/18- Justice in Mexico, a research and public policy program based at the University of San Diego, released its 2018 special report on Drug Violence in Mexico, co-authored by Laura Calderón, Octavio Rodríguez Ferreira, and David A. Shirk. The report examines trends in violence and organized crime in Mexico through 2017. The study compiles the latest available data and analysis of trends to help separate the signals from the noise to help better understand the facets, implications, and possible remedies to the ongoing crisis of violence, corruption, and human rights violations associated with the war on drugs. Mexico experienced dramatic increases in crime and violence over the last decade. The number of intentional homicides documented by Mexico’s National Institute of Statistics, Geography, and Information (INEGI) declined significantly under both presidents Ernesto Zedillo (1994-2000) and Vicente Fox (2000-2006), but rose dramatically after 2007, the first year in office for President Felipe Calderón (2006-2012). All told, throughout the Calderón administration, INEGI reported 121,669 homicides, an average of over 20,000 people per year, more than 55 people per day, or just over two people every hour. Over that period, no other country in the Western Hemisphere had seen such a large increase either in its homicide rate or in the absolute number of homicides. Yet, over 116,000 people have been murdered under Mexican President Enrique Peña Nieto (2012-2018), despite his campaign pledge that violence would decline dramatically within the first year of his administration. In fact, there were an average of 23,293 homicides per year during the first five years of Peña Nieto’s term, nearly 4,000 more per year than during Calderón’s first five years in office. As such, the annual average number of homicides under the Peña Nieto administration is now about 20% higher than during the Calderón administration, whose first two years saw much lower levels of homicide. In 2017, state-level increases in intentional homicide cases were found in all but 6 states. The top five states with the largest number of intentional homicide cases in 2017 were Guerrero (2,318), Baja California (2,092), Mexico State (2,041), Veracruz (1,641), and Chihuahua (1,369). In 2017, the state with the largest annual increase in total homicides was Baja California, with most of that increase concentrated in the city of Tijuana, as discussed below. However, the largest percentage increases in homicide cases were found in Nayarit (554% increase) and Baja California Sur (192% increase). At the state level, the largest numerical and percentage decrease in homicides was found in the state of Campeche, which saw 67 homicide cases in 2017, down 17 cases (20% less) compared to the previous year. Journalists and mayors are several times more likely to be killed than ordinary citizens. According to a recent Justice in Mexico study by Laura Calderón using data from 2016, Mexican journalists were at least three times more likely to be killed (.7 per 1,000) than the general population (.21 per 1,000), and mayors are at least twelve times more likely (2.46 murders per 1,000). Justice in Mexico’s Memoria dataset includes 152 mayors, candidates, and former mayors killed from 2005 through 2017, with 14 victims in 2015, six in 2016, and 21 in 2017. In total, nine sitting mayors were killed in 2017. Mexico’s recent violence is largely attributable to drug trafficking and organized crime. 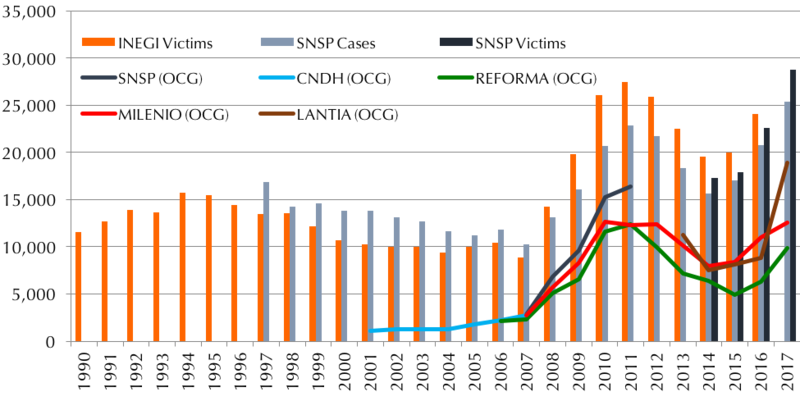 Tallies produced over the past decade by government, media, academic, NGO, and consulting organizations suggest that roughly a third to half of all homicides in Mexico bear signs of organized crime-style violence, including the use of high-caliber automatic weapons, torture, dismemberment, and explicit messages involving organized-crime groups. Based on INEGI’s projected tally of 116,468 homicides from 2013 to 2017, at least 29.7% and perhaps as many as 46.9% of these homicides (34,663 according to newspaper Reforma and as many as 54,631 according to Lantia consulting service) appeared to involve organized crime. The country’s recent violence could be a concern in Mexico’s 2018 presidential election. The worsening of security conditions over the past three years has been a major setback for President Enrique Peña Nieto (2012-2018), who pledged to reduce violence dramatically during his administration. Peña Nieto has received record low approval ratings during his first five years in office, in part due to perceptions of his handling of issues of crime, violence, and corruption, particularly after the disappearance and murder of dozens of students from Ayotzinapa, Guerrero in 2014. Mexico will hold elections in July 2018 and the next president will take office in December 2018. Since there is widespread concern about Mexico’s elevated levels of crime and violence, candidates for public office will feel pressure to take a stand on these issues and may even be targeted for violence for violence. This entry was posted in Crime and Violence, Special Reports and tagged David Shirk, drug trafficking, Drug Violence, Justice in Mexico, Laura Calderon, Octavio Rodriguez, organized crime. Bookmark the permalink.